To formally, if not ritually, bring an individual into a specific group or organization. The initiation process can be triggered by coming of age and reaching a certain societal point of maturation, by accomplishing a series of tasks, or by learning the steps, songs, and procedures of various ceremonials, among many other possibilities. To become initiated into a group suggests that one has passed from one stage of life into another, from one series of responsibilities to another, and from one set of behaviors to another. 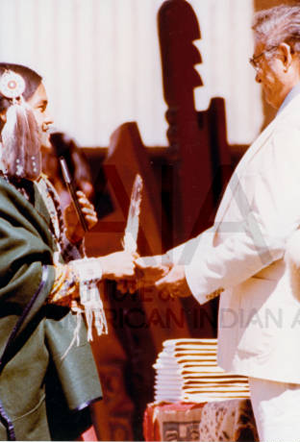 "Institute of American Indian Arts graduation ceremony circa 1975." Archives of IAIA (box08f01i12.jpg). Institute of American Indian Arts, Santa Fe. American Mosaic: The American Indian Experience. 1981 Southwestern Indian Ritual Drama. Albuquerque: University of New Mexico Press.